For too long, creativity in schools has been almost solely associated with art, music, and writing classes. Now, creative thinking skills are increasingly emphasized across the disciplines. At the same time, technological progress has brought about calls for the integration of new literacies and computational thinking to prepare students as problem solvers and critical thinkers. However, in teaching and learning, all three perspectives most often manifest in isolation. We believe this is to the detriment of both educators and students alike. In this paper, we develop an argument for the use of new literacies and computational thinking to promote creative thinking. First, we explore the various elements that comprise computational thinking, while demonstrating their overlap with the theoretical constructs of creative thinking. Second, we identify the design decisions that guided our plan for integrating all three perspectives in a sequence of educational technology courses designed for in-service teachers. Finally, we provide examples of the classroom activities that best facilitated creative thinking, and address how we achieved them. DeSchryver, M.D. & Yadav, A. (2015). Creative and Computational Thinking in the Context of New Literacies: Working with Teachers to Scaffold Complex Technology-Mediated Approaches to Teaching and Learning. 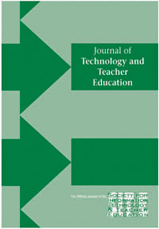 Journal of Technology and Teacher Education, 23 (3), 411-431. Waynesville, NC USA: Society for Information Technology & Teacher Education. Retrieved April 24, 2019 from https://www.learntechlib.org/primary/p/151572/. Beck, J. & Burg, K. (2011). Cinemagraphs. Retrieved from http://cinemagraphs.com/ Bertram, V. (2014, May 7). We have to get serious about creativity and problem solving. The Huffington Post. Retrieved from http://www.huffin Gtonpost. De Souza Fleith, D. (2000). Teacher and student perceptions of creativity in the classroom environment. Roeper Review, 22, 148–154. Gelb, M.J. (1998). How to think like Leonardo da Vinci. New york. Grover, S. & Pea, R. (2013). Computational thinking in K-12: a review of the state of the field. Educational Researcher, 42(1), 38-43. Kereluik, K., Mishra, P., & Koehler, M. (2011). On learning to subvert signs: literacy, technology and the TPacK framework. The California Reader, 44(2), 12-18. Kress, G. (2003). Literacy in the new media age. New york: routledge. Lankshear, C., & Knobel, M. (2011). New literacies: Everyday practices and classroom learning (2rd ed.). Berkshire, UK: Open University Press. Lassig, C.J. (2009). Promoting creativity in education– From policy to practice: an australian perspective. In Proceedings of Creativity and Cognition 2009: Everyday creativity– Shared languages and collective action (pp. 229-238). Berkeley, ca: association for computer Machinery. Michalko, M. (2006). Thinkertoys: A Handbook of Creative-Thinking Techniques. Ten Speed Press. Mishra, P., yadav, A., & The Deep-Play research Group (2013). Of art and algorithms: rethinking Technology& Creativity in the 21st century, TechTrends, 57(3), 10-14. Myers, J. (1995). The value-laden assumptions of our interpretive practices. Reading Research Quarterly, 30(3), 582-587. Sawyer, K. (2004). Creative teaching: collaborative discussion as disciplined improvisation. Educational Researcher, 33(2), 12-30. Sawyer, K. (2006). Explaining creativity: The science of human innovation. New york: Oxford Univ. Press. Sawyer, K. (2011). Structure and improvisation in creative teaching. New york, ny: cambridge University Press. Sawyer, K. (2012). Explaining creativity: The science of human innovation. Second Edition. New york: Oxford Univ. Press. Sawyer, K. (2013). Zig zag: The surprising path to greater creativity. San Francisco: Jossey-Bass. Sitkin, S.B. (1992) learning Through Failure: The Strategy of Small losses. Research in Organizational Behavior, 14, 231–266. Walsh (2009). Pedagogic potentials of multimodal literacy. In Win, L.T.W. & Subramaniam, R. (eds. ), Handbook of research on new media literacy at the K-12 level: Issues and challenges, hershey, Pa:iGi Global. Wing, J. (2011). Research notebook: computational thinking—What and why? The Link Magazine, Spring. Carnegie Mellon University, Pittsburgh.